As this war is evolving, it is essential to see who is supporting it and how and why they are supporting it, in the Colonies and, more specifically, in our area. At the start, everyone in America is a British subject; therefore, you will sometimes hear the war referred to as a civil war, neighbor against neighbor, brother against brother, or as a rebellion (according to the king’s people). It isn’t a typographical error to read united States of America instead of United States of America, as at this point in time we are united by a common ideal but we were not the formal United States of America we know today. There is no Constitution or Articles of Confederation — but only a commonality uniting people to govern themselves. Despite not being united, citizens were united in their unhappiness with Great Britain. Wealthy and powerful colonial merchants were not happy that England was taxing the Colonies. Many were also smugglers themselves bringing in merchandise from other countries to avoid the tax, and tea was among those products. Although the surplus tea from England’s East India Company was cheaper even with tax included, American shippers bought tea elsewhere and smuggled it in so England did not get tax revenue from the product. It affected everyone. Many of those now living in the Colonies left England because of the monarchy. As citizens of the United States of America, think about these complaints and how you would feel if this were happening to you today. The populace in 1776 became aware of current events through newspapers, which were passed along or read aloud in a tavern (a place to eat, drink and sleep), so even the illiterate learned the news. In 1776 it is estimated there were 2.5 million people in the Colonies (6.5 to 7.5 million in Great Britain).1 So the everyday citizen was being made aware of what was happening and he was getting fired up. Another way information went out was in the pamphlets that were written. Two of the most famous writers were Thomas Paine, who wrote “Common Sense” and “The American Crisis,” and John Dickinson, who wrote “Letters from a Farmer in Pennsylvania,” but there were many more pamphlets written during this time period. At a time when even the largest colonial newspapers had circulations under 2,000, historians estimate that “Common Sense” sold 120,000 copies in its first three months alone. Based on population, a comparable figure today would be 10 million.3 Pamphlets and their impact will be explored more closely in a subsequent article. Despite the colonists discontent, people continued to come to this country, but they also continued moving, which was not unusual for the time period. This was where the population growth came from in the cities and, to a point, within the rural areas. Immigrants came to Philadelphia, but disease, lack of jobs and crowded conditions motivated many to move inward; after all, this was a populace already on the move to get here from Europe and other locations. 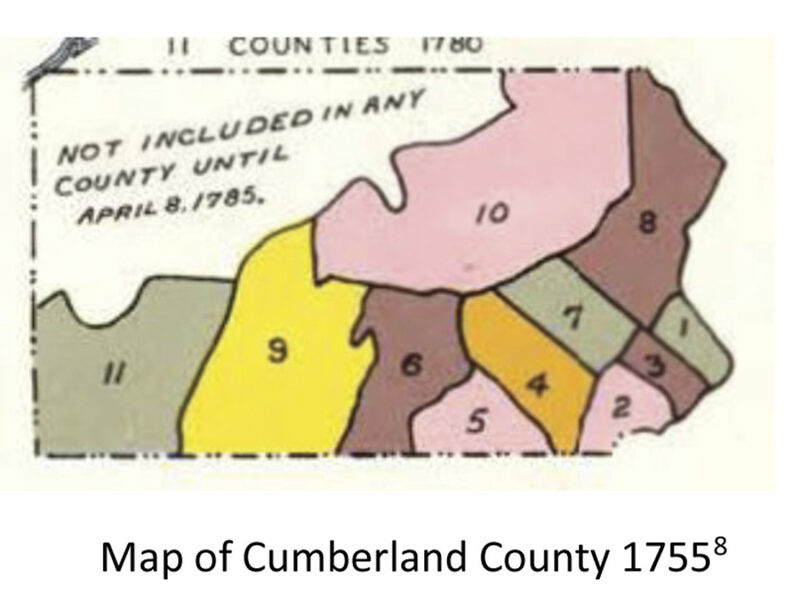 Even our own county, which was Cumberland at the time (see map), had 18,243 people in 1790 when the first census was taken. Cumberland County took in what is today Bedford, Blair, Centre, Franklin, Fulton, Huntingdon, Juniata, Mifflin and Perry counties.5 This area supplied a lot of essentials to the cause of the Revolution — primarily food. Carlisle, our county seat at the time, became the quartermaster supply center and was a major supplier of military stores like cannon balls, shells, muskets and cannon barrels. The powder magazine still stands today. Fort Roberdeau in Blair County was a supplier of lead balls for the Continental Army from three separate mines. The other issue that cannot be forgotten is that while the county and the colonies were ramping up for the Revolution, Cumberland County was still fighting on the frontier against Indians on the west, while facing the revolution in the east. For instance, a Tory uprising had to be put down in Bedford. It is estimated that 33 percent of the Colonists supported the revolution, 33 percent supported staying loyal to the crown (Loyalist or Tory) and 33 percent didn’t really care — or would flip from side to side depending on who was in control of the town or would flip if they could profit from sales to either side. Wealthy merchants, shippers, storekeepers, farmers, lead miners and smelters were all trying to build a town, a county and a country while fighting a war. Soldiers going to war were leaving their families behind or, in some cases, taking them with them as camp followers to wash, sew, cook, nurse the wounded and fight, for women did fight in the Revolution. The soldiers emerged from these groups: Militia, Loyalists, Rangers, Cavalry, Continental Line and British Soldiers of the Line. Who were they? Were they wealthy or poor, slaves or Indians? Were they from different countries? What about the Hessians? Were they mercenaries or the King of Prussia’s soldiers fighting for the crown? How many soldiers served on each side? What was their food ration? Perhaps we also need to look closer at camp followers, pamphlets, Cumberland County and the clothing and accoutrements the soldiers carried with them. To fully understand what was happening, these are questions that should be explored in more detail in another time. Before considering those questions, take time to read the Declaration of Independence! It is basically three parts after the Preamble: 1.The statement declaring the rights of the citizen; 2. How King George and Parliament have not protected their rights (complaints); 3. Independence is declared. History was truly made with the Declaration of Independence, the foundation of the United States of America. 3. Paine, Thomas, The American Crisis, ed. Trees, Andrew, Barnes and Noble, Inc., New York, NY 2010, p. ix.